Killer Characters: I'll Get You, My Pretty...And Your Big Dog Too! I'll Get You, My Pretty...And Your Big Dog Too! I know some of the people in Tallulah Falls think I'm the Wicked Witch of Oregon because I'd like nothing more than to get rid of that Marcy Singer. Oh, she tries to act nice enough; but our little town has had nothing but trouble since she moved in.Why, her shop--the Seven-Year Stitch--hadn't been open a week when she went in and found a dead man in her storage room! My sister Clara had wanted to lease that space, but Marcy's friend Sadie MacKenzie got to it first. She snapped it right out from under poor Clara. But now, Clara has another chance. The shop between Marcy's shop and mine--I own an aromatherapy boutique called Scentsibilities--just came available. I called Clara, and she leased the shop right away. Well, Clara and I did some brainstorming, and she's going to call her shop Knitted and Needled. That's cute, don't you think? You see, Clara loves to knit, so her shop will contain knitting supplies. And, while we're at it, we might as well offer embroidery supplies too. I figure we'll give the Seven-Year Stitch some competition, and if Marcy can't handle the heat, she can get herself and that big overgrown dog of hers right out of Tallulah Falls. Plus, there's a Renaissance Faire coming up. That Faire will be the perfect opportunity to showcase Clara's new shop and win over the residents of Tallulah Falls. Everybody will see what good merchandise Clara has to offer. I just hope I can convince her to be a little nicer to people. She doesn't always make the best first impression. Clara has an abrasive way about her, and she can sometimes come off as being offensive to those who don't know her well enough to know better. But, she'll be fine. I'll help her. So, what do you think? Will Marcy be intimidated by a little friendly competition? Would you be? 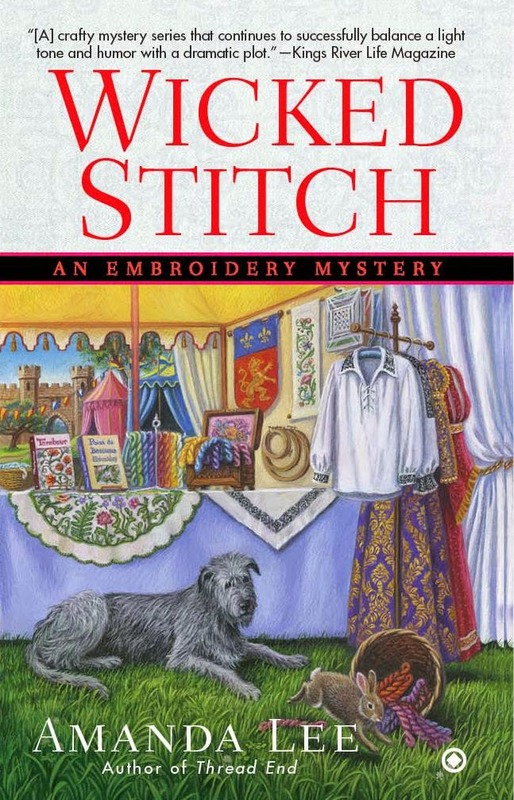 Look for Wicked Stitch on April 7, 2015. In the meantime, watch the book trailer and get more information about the book at the author's website. Competition is a good thing....gives the consumer numerous options and often a variety of merchandise to choose from. I agree with Dianne B. With two stores side by side, you'll bring more customers to both. It works for us in Threadville! It's true that a little competition will make Marcy just step up her game. Clara's just going to have to put her best face forward and learn to be polite to the people coming in to her store or she'll be out of business very quickly. With the stores being so close together, the owners will HAVE to cater to their customers to keep them coming into their store. And if each owner works at getting things in that the other store doesn't carry, everyone wins.